Connaught Place in itself does not need to be defined or introduced anymore. Neither do we need any reason to visit it. 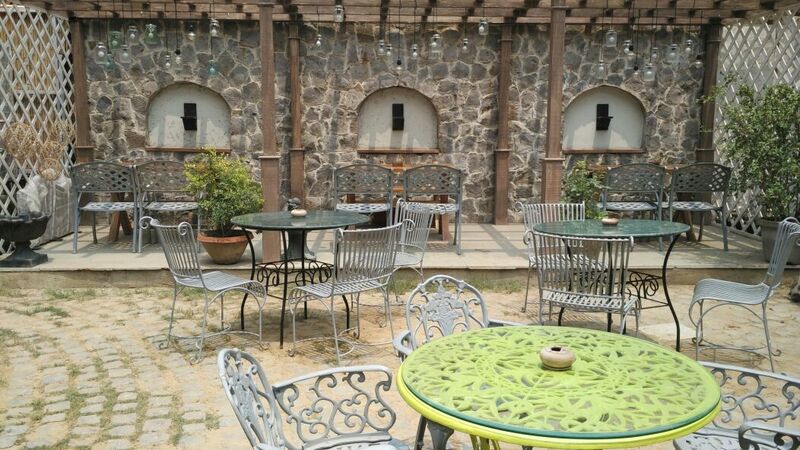 It’s the heart of the Delhi and nowadays can even be termed as a food and lounge hub. Everyday this place gives us a surprise gift all wrapped up in form of a new café or a pub to celebrate life in our own way. 52 Janpath is a special one for the people. 52 Janpath is like a hidden gem making its way away from the bustling and busy avenue that is Janpath. One needs to pass a narrow dim lighted alley to enter the property and experience the visual treat and a feeling of comfort that is conveyed and feels like ‘Home’. That’s exactly what their tagline is –“Home away from home”. The area is more like a living room comprising of contemporary sofas with fireplace, modern sofas with full fledged study rack next to it, wing chairs and dining tables. There is an outdoor seating too which again is very beautiful and can be enjoyed best in winters. The food and drinks served here are remarkable, a perfect blend of innovation, creativity and flavors resulting in a master dish. Some of the best non alcoholic drinks available here are – Monk n Cinnamon Mojito, Strawberry Basil Caipiros, Virgin Sangria Mango n Cinnamon slush. All the drinks are very refreshing complimented by fresh fruits. The cocktail menu too has a good list to offer. Some of the cocktails which can make anyone hold their glasses till the end are Green Apple Martini, Margarita, Mexican Brothers, Old Fashioned and Sangrias. Food – There is nothing at all which cannot impress a foodie with its taste rather some of the dishes carry such wow factor, portraying nothing but excellence. Duo of Char Grilled Chicken – Mascarpone and Saffron, Burnt Garlic and Kaffir lime marinade. Cold Open Wontons – This is one of the most creative dish one can think of. Semolina cups filled with herbs and litchi. Health meets taste perfectly!! Lousiana cottage cheese – Large chunks of cottage cheese filled with secret filling, marinated in yoghurt n spices. Caponata Strudel (parcel )- Phylo bites, artichoke, mushrooms, caramelized onion, goat cheese. Celtic Caesar – Lettuce tossed with parmesan onion and Caesar dressing topped with homemade croutons available in both veg/non veg options. Pasta/pizza/burger – A foodie can never be satiated without these options, therefore the chef here does not leave a chance to feed them happily. Rigatoni Genovese and Toscana are the best available options in pasta, comprising of fresh veggies/prawns and cheese. Pizza – CPR Pizza, a crusty base loaded with chorizo, pepperoni, rocket leaves, cherry tomato and parmesan cheese. A true delight for any non-vegetarian. Rusticana pizza, loaded with wilted spinach, corn, red onion, ricotta and jalapeño. Burger – Cantina burger, what makes this burger special n gooey is the kidney beans patty. The burger is huge and heavenly stuffed with huge patty and veggies. The best option available in non veg burger is the three little meat sliders. 52 Janpath has not only pulled out the international cusines to its best but has even highlighted the Indian dishes perfectly. The main course menu covers all the Indian delights very well. Wild mushroom Matar, Dal Makhni, Cottage cheese roulade, Ammas mutton curry, Bibi ka mutton pulao, Pineapple fried rice are some dishes which have the original Indian taste with a play of innovation and presentation. Nothing is better than a good dessert to end a food journey. This place serves multiple desserts to make that journey more fascinating. Tiramisu, chocolate mud and mango cheesecake are one of those. 52 Janpath is a place which one can mark for spending all the good times and occasions with leisure and of course food.